After other additions and changes, it was time for the safe trade to receive some love. With this change, it is now possible to do trades of over 640,000 so it should cover most items you could possibly want to trade. For trades below 100 sc, you can simply do /pay as the amount is very small and most likely won’t hurt you much if the other person doesn’t keep to her end of the deal. The other big change is now in the interface itself, as all items have received suggestive names and tooltips. Simply move your mouse above an item of the interface to see what it does. This entry was posted in Minecraft Skyblock Server News on April 22, 2013 by heatseeker0. I’ll look into it, but even under very heavy load on the test server I wasn’t able to make the safe trade not to show up. so heat? is there not a way to get 1 10 and 50 in safetrade anymore? I can, but… is it really needed? More buttons to push will only make it harder to use, especially for new players. 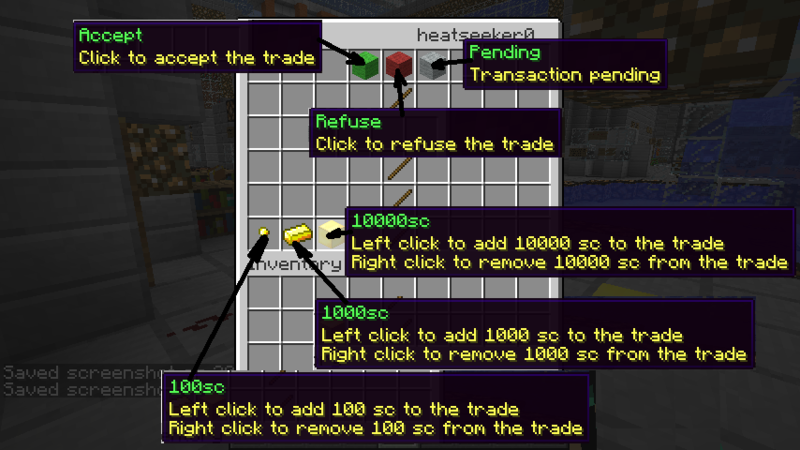 The safe trade is currently disabled because you loose one of the item your holding with the right click and other scamming in the trade. So the mods have disabled it. That’s correct. It will be re-enabled when I’m feeling a bit better and able to code a fix for it.